Congratulations to Lauren on winning a P.E.O. Scholar Award! P.E.O. is committed to its educational mission of helping women support their various educational goals through loans, grants and scholarships. Another piece of work of former postdoc and now assistant professor at CSU, Justin Sambur, accepted by J. Electrochem. Soc. on correlated reaction and photoelectrochemical current imaging of nanoscale photoanodes in water splitting. 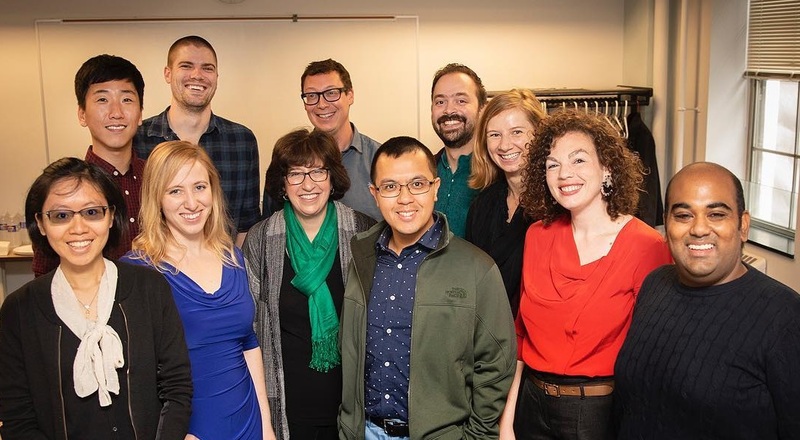 Postdoc Rocky wins the 2019 Victor K. LeMar Award for his graduate research at UC Berkeley, presented by the Division of Colloid and Surface Chemistry of the American Chemical Society. Congratulations! Congratulations to Chunming on officially accepting an Assistant Professor position in Polymer Science at University of Akron! Peng is selected for an 2019 Chemical Pioneer Award. Established in 1966, it is awarded by the American Institute of Chemists to recognize chemists or chemical engineers who have made outstanding contributions to advances in chemistry or the chemical profession. Peng is recognized for his pioneering contributions to the study of catalysis on single nanoparticles. Cornell Chronicle features Mahdi's work: "A first: Cornell researchers quantify photocurrent loss in particle interface." Congratulations to Lauren on winning a NIH F31 NRSA Predoctoral Fellowship! Rocky and Xianwen's Perspective on the analogy between enzyme and nanoparticle catalysis accepted by ACS Catalysis. Mahdi's benchmark work in defining the photocurrent loss from a single particle-particle interface in nanostructured photoelectrodes accepted by Nano Letters. Peng is elected a Fellow of the American Association for the Advancement of Science (AAAS), for distinguished contributions to the field of single-molecule microscopy, particularly for pioneering its development and application in studying catalysis and bioinorganic metal homeostasis. Peng is selected for the 2018 Bau Family Award in Inorganic Chemistry. Established in 2008 by the late Prof. Robert Bau, an international figure known for his pioneering studies on the chemistry of transition-metal hydride complexes, this biennial award is given to a young inorganic chemist under the age of 45 in recognition of his/her outstanding achievements. "A first: Cornell researchers quantify photocurrent loss in particle interface," Cornell Chronicle, January 30, 2019. JACS spotlights: "Photo(electro)catalysts, ready for their extreme close-up," J. Am. Chem. Soc. 2018, 140, 6727-6728. "Communicating catalysts," Nature Chem. 2018, 10, 580-582. "Communication is key in nanocatalysts too," Nanotechweb.org, UK Institute of Physics. "Nanoparticle catalysts communicate across distances," Chem. Eng. News 2018, 96, 6. "Understanding nanocatalysts' 'talk' could better inform design," Cornell Chronicle, March 26, 2018. Army Research Lab YouTube video: "Army research is paving way to materials of the future." "Army research leading to materials of the future wins national award," Army Research Lab press release; February 6, 2018. "Research of the Year," Chem. Eng. News 2017, 95(49). "Method reveals secrets of bimetallic catalysts" Chem. Eng. News 2017, 95, 9. "First-ever visualization of enhanced catalytic activity reported" Cornell Chronicle, Nov 1, 2017. "Polymer chains grow one ‘hairball’ at a time" Nature 2017, 550 (7677), research highlights. "Experiment shows that polymers grow in spurts," This Week in Chemistry, Compound Interest. "Close up view of growing polymer chain show jump steps" Phys.org, October 20, 2017. "Polymers: Watching growth, step by step" Science 2017, 358, 316. "Single-molecule experiment reveals polymer growth spurts" Chem. Eng. News 2017, 95, 4. "Magnetic tweezers reveal ‘hairballs’ in polymer growth" Cornell Chronicle, Oct 19, 2017. "E. coli bacteria's defense secret revealed" Cornell Chronicle, June 12, 2017. "A ‘Hole’ New World: Improving the Efficiency of Water Splitting," Cornell Daily Sun, March 1, 2016. “Water Splitting: Placing the catalyst where it's needed” Science 2016, 351, 828. "Electrochemistry: Photocatalysts in close-up," Nature 2016, 530, 36-37. "Fluorescence Method Maps Reactivity Hot Spots On A Catalyst’s Surface," Chem. Eng. News 2016, 94, 8. "Researchers seek efficient means of splitting water," Cornell Chronicle, Feb 4, 2016. Faculty of 1000 Prime recommendation on Danya's PNAS paper (PNAS, 2015, 112, 13467). "Understanding Of Bacterial Protein’s Defense Strategy Could Lead To Antibiotics,"Chemical & Engineering News, 2015, 93, 7. "How Transcription Factors Depart Their Targets In Cells," Chemical & Engineering News, 2015, 93, 25. "Research finds protein regulation linked to cells' growth cycle," Cornell Chronicle, July 2015. "The Scientist: Prof. Peng Chen Studies Reactions On the Nanoscale", Cornell Daily Sun, March 19, 2014. "Imaging method identifies most active catalyst particles", Chemical & Engineering News, 2013, 91, 31. "Proteins barge in to turn off unneeded genes and save energy", Cornell Chronicle, September 5, 2012. "Study Reveals Understanding Surface Defects is Important to Design Better Fuel Cells" by Cameron Chai on Azom.com. "Catalytic Particles Feature Spatial-Activity Hot Spots" by Mitch Jacoby, Chemical and Engineering News, 2012, 90, 53. "Mapping the reactivity of single nanocatalysts" by Nina Notma, Chemistry World, February 22, 2012. "To make better fuel cells, study the defects" by Bill Steele, Cornell Chronicle, February 20, 2012. “Picture perfect pentacene” by James Mitchell Crow, Chemistry World, January 2011, 46-49. "Pinpointing catalytic reaction sites on carbon nanotube walls" by Michael Berger, Nanowerk, April 21, 2009. "Single-Molecule Fluorescence Events Seen In Real Time" by Mitch Jacoby, Chemical& Engineering News, April 20, 2009, 87, 38. "Catalytic behaviour of SWCNTs scrutinised" by Nina Notman, Chemistry World, April 20, 2009. "Finding how carbon nanotubes work as catalysts could lead to cleaner fuels" by Bill Steele, Cornell Chronicle. "Single nanocatalyst behavior revealed" by Nina Notman, Chemistry World, February 18, 2009. "Monitoring catalysis one particle at a time," Nanotechnology Alert, Jan 23, 2009, Frost & Sullivan. "Scrutinizing Catalysts" by Mitch Jacoby, Chemical & Engineering News science highlight, 2008, 86, 9. "When A Good Nanoparticle Goes Bad," National Science Foundation press release. "New method can capture catalysis, one molecule at a time," by Bill Steele, Cornell Chronicle. "When a Good Nanoparticle Goes Bad," news highlight by Cornell Center for Materials Research. "Watching A Catalyst at Work," New Energy and Fuel. "Gold study 'could lead to smart catalysts being produced'" Gold News.